Noticing the recurring elements embodied in the work of great designers, interior designer/author Gary Inman created a three-part panel series to address them. These discussions explore the Art of Design via Antiques, Travel, and Collections. With two of the three talks already completed, we anticipate The Art of Collecting panel to be held at Currey & Co. on Saturday April 6th during Spring Market with Gary moderating these esteemed panelists: designers Barry Dixon, Larry Laslo, and Michelle Workman, and technology entrepreneur Stacey Tiveron. Designers Today is delighted to be the media sponsor. Prior to the panel, Designers Today interviews each participant about their collecting goals, habits, and perspectives. Naturally we begin with Gary Inman whose historical perspective, fashion background and appreciation for the art of fine living is apparent in all he gathers. Q: Gary, from all the goodies that you collect, what stands out the most? A: I love my collection of Basalt Wedgewood, my 1000 plus books, and my architectural print collection, but my absolute obsession are couture handbags. 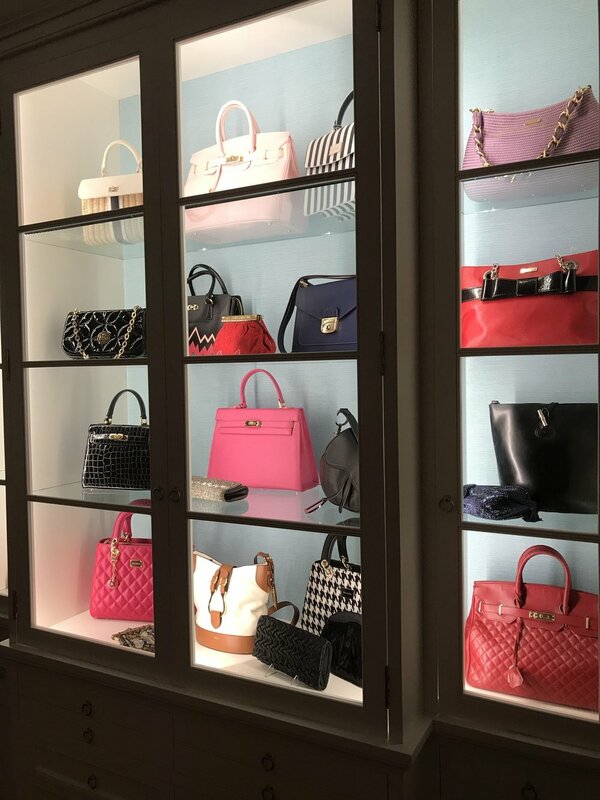 I have built a beautiful collection over the past decade that includes Hermes, Ferragamo, Courreges, Chanel, Yves St. Laurent, Givenchy, Diane Love, Eric Javits, Judith Leiber, and my greatest find, an equestrian inspired vintage Gucci bag made famous by Jackie Kennedy. Q: What are you currently looking for? A: I’m always looking for another stunning vintage Hermes Scarf. I started the collection for my wife but when she refused to wear ‘fussy scarves’ they became my signature fashion element. That and my hats! Q: Did you ever wish that you were free of the desire to acquire? Wouldn’t life be simpler? A: Great taste is a gift, and a burden! When I’m practicing yoga or meditation, I have a momentary urge to simplify and cleanse my life. Then I go home, and I realize my collections give me great joy every single day. Give me a cup of green tea and a Hermes scarf and I’m in heaven! I believe you can have both possessions and tranquility. Q: Tell me about your most successful hunt/s? A: My best hunt was for a Renaissance sculpture. I had a vision in my mind for years and when I was in Florence recently, I set out on a quest to find her. After a few hours shopping in the Oltrarno district, I noticed a shop window with several figural busts. I quickly crossed the street and did a visual sweep of the window but no magic. I popped into the shop to explore further and there she was, the woman who had been haunting my dreams for years. Fiametta, Italian for flickering flame, a Medici princess made famous by Dante Gabriel Rossetti during the late 19th Century Pre-Raphaelite Movement in England. 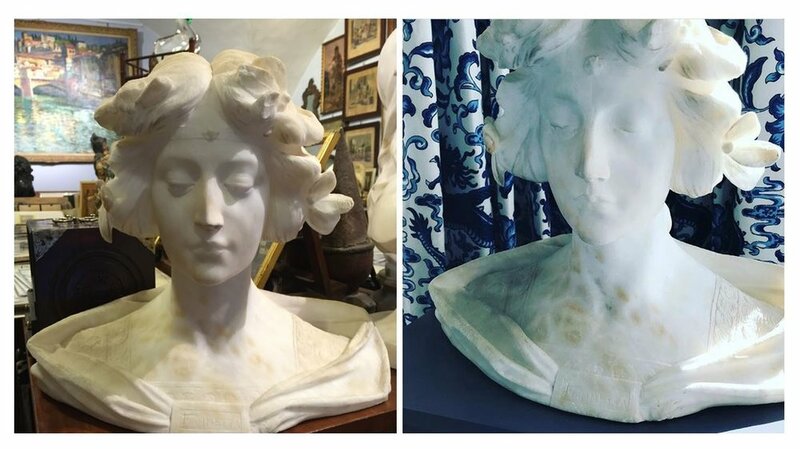 My Fiametta is carved of solid alabaster, her upswept hair and long swan-like neck the perfection of feminine beauty. She lives in my dining room and is a constant companion that brings me joy every day. A close second…..my Mason & Hamlin grand piano, ca. 1920, that I had fully restored last year. I play each day and it releases my mind from the stress of the day. The beauty is it is a family heirloom. I waited thirty years to bring this piece of family history to my home. The lesson I learned, great antiques require patience! Q: Do you sometimes travel to Europe to procure? A: Yes. I went to Florence, Sienna, and Venice for a client recently and it was exhilarating both for me and my client. We purchased antiques, art, textiles, and Murano glass via text messages. I had a chance to film master glass blowers at Barovier & Tasso, the world’s oldest glass company, ca. 1295, on the Island of Murano. The chandelier and sconces they were making now hang in my client’s home. Q: How do you like to decorate with collections? A: I love collections in public spaces and private spaces. The theme and storyline determine the locations. I like to group similar items into a unified powerful display and create geometric arrangements of objects. Staircases can be a wonderful place for a grid of images. Q: Are you tasked with creating collections for hospitality projects? A: Yes, but it is rarer than with residential. My favorite aspect of decorating historic hotels is that they often come with a collection that I can use as the core of the design story. I also work with curatorial services to build meaningful collections for hotels, resorts, and clubs. I’m presently creating and curating a collection of images and archeological artifacts from the Chickahominy and James River cultures for Two Rivers Country Club in Williamsburg. The design is a celebration of the beautiful setting and its history for the last five centuries. Q: Any favorite books on this subject? A: I must share two that I’ve used in teaching and writing lectures. Great Women Collectors by Charlotte Gere and Marina Vaizey, Harry N. Abrams, Inc., Publishers. 1999. It includes my Muse, Coco Chanel. And A Passion for Antiques by Barbara Milo Ohrbach, Clarkson Potter/Publisher, 2004. Q: Is there a collection out there that you covet? A: Many! Ralph Lauren’s vintage automobile collection is at the top of my dream list.